Two-Sentence Summary Ursula and Cruella’s arrival in Storybrooke forces Regina, Hook, Snow, and Charming to confront past moments of darkness. Flashbacks to the Enchanted Forest reveal that an encounter with the Queens of Darkness led to Snow and Charming becoming aware of Emma’s potential for darkness, a potential that’s keeping them from revealing this secret to their daughter as well as one more: They were responsible for Maleficent losing her child. Emma: I’m going to choose to see the best in you. Hook: And I with you. My Thoughts If “Unforgiven” had a subtitle title, it would be: “Secrets, secrets are no fun. Secrets, secrets hurt someone.” It seemed like everyone was keeping secrets or being asked to keep secrets in this episode, and it was all at Emma’s expense. However, this episode ended with one of those secrets at least partially revealed (Hook coming clean about the fact that he and Ursula have an ugly past that he isn’t quite ready to share) but another (Emma’s dark potential and its connection to the loss of Maleficent’s child) being guarded more closely than ever by Snow and Charming—and now Regina, too. If last week’s “Darkness on the Edge of Town” was about self-awareness, then “Unforgiven” was about whether or not the way we see ourselves matches the way others see us. In some instances, this episode showed examples of people doing things to change the way others saw them for the better. There were also examples of people doing drastic things to keep others from seeing hidden darkness. And in the episode’s most powerful moments, it gave us pairs of characters who accept each other for every part of who they are and could be. The “Operation Mongoose” storyline seemed to feature all three of those examples. Regina started the episode telling Cruella and Ursula to never bring up her dark deeds in front of Henry. However, Henry knows Regina was the Evil Queen; he knows her darkness, but he’s chosen instead to believe in her potential for goodness. Everyone needs someone in their lives who believes in the best they can be, and Henry has been that for Regina for quite some time now. Because of the support of Henry (and also Emma), Regina has been able to take the belief others have in her best self and start turning it into her own belief in her best self. So even when she has a setback, like she did with her outburst at Pinocchio and Geppetto, it’s not a reason for her to lose faith in herself and her potential for goodness. In fact, it becomes a moment for increased self-awareness and real growth. Regina’s apology to Geppetto was one of the best scenes in the episode. Lana Parrilla brought such vulnerability and honesty to that moment, and it made me see how hard this is for Regina, which made it all the more relatable. Growth is hard. Choosing to be better than who you once were is hard. It’s not all forward progress and moments of pride—not if it’s genuine. And this show is presenting Regina’s story in a way that’s as real and messy as it gets, and that’s why it’s so good. Regina’s struggle to choose to be better that her past is incredibly inspiring. In this episode, it showed us that even if you have a bad day or a relapse or a step backward on the journey of growth, it doesn’t mean all hope is lost. You have the ability to choose to acknowledge your step backward and choose to then take two steps forward. And that’s exactly what Regina did. She apologized and admitted that she won’t ever find true happiness acting the way she did—like her worst self. The amount of growth shown in that one moment was astounding, and it led to something that has made me more hopeful about Operation Mongoose than I’ve been yet. Regina’s choice to be her best self and apologize to Geppetto led to him giving her August’s backpack. Not only did the backpack end up providing a very vague clue about the Author, it showed that Geppetto was able to see Regina as someone worthy of a happy ending. It showed hope and belief that people could have known Regina at her worst but could now choose to see her at her best not because of an Author but because of her actions and choices. And that’s what I’ve been hoping for all along out of this storyline: that Regina comes to learn she has the power to change how others see her by her choices. The book is a record of her past—she’s the author of her future. Regina’s ability to choose to be better than her dark past is surely going to be put to the test now that she’s going undercover with the Queens of Darkness. But I’m really looking forward to seeing her face this test and hopefully come out of it stronger than ever—and with a good sense of the people she can rely on to help her be her best self. And if it means more time with this trio of fierce lady villains, then I am all for it. I did not expect to love the Queens of Darkness so intensely already, but here I am. They bring a fun new energy to the show (I loved Cruella’s line about her necklace being made of blood diamonds. ), but what I appreciate more than anything is that they’re another example of strong relationships between women on Once Upon a Time. From Cruella and Ursula being genuinely happy to see Maleficent again to Cruella’s comforting hand on Ursula’s back as they walked past Hook, this episode presented these women as a kind of supportive sisterhood. It may be a dark sisterhood, but it still seems to be an example of strong bonds of female friendship, which I always think we need more of on television. What’s especially interesting about Regina’s undercover trip to the dark side is that she’s being put up to it by Snow in order to help Snow cover up her own darkness. That last scene between the two women was fascinating because they’re this show’s shining example of deep, complicated relationships between women, and it just got even more complicated. These two women know each other’s full selves—from their brightest potential to the darkest spots on their hearts. Having Snow ask Regina to keep a secret for her when she couldn’t do the same for Regina in her youth was such a powerful moment, and I loved the emotion Ginnifer Goodwin brought to it. I wonder if Regina will eventually tell Snow’s secret to Emma because she believes Emma deserves to know. It would be a nice moment of symmetry after Snow told Regina’s secret all those years ago. I also thought it was fascinating to see Snow tell Regina that she and Charming were the reasons Maleficent lost her baby. Motherhood is such a central part of this show, and Regina was the reason Snow lost her first baby for 28 years. All of the women involved in this secret—including Emma—are mothers, which allows all of them to relate to the idea of keeping secrets from your children for what you think is their own good. It hurt me to watch Snow and Charming deliberately keep Emma in the dark throughout this episode, and it hurt even more to watch Emma shut down her instincts and lie-detecting superpower because she wanted to trust them. The secret about Maleficent’s baby is one I could see them keeping out of shame (much like Hook and whatever happened with Ursula), but it’s the secret about Emma’s identity that feels even darker. Emma grew up not knowing who she really was, and when someone she loved found out her true identity, not only did he not tell her, he left her. She spent 28 years literally having no awareness of her true self. And now her parents are still keeping information about her true identity from her because they fear her potential for darkness. All of a sudden, Snow’s extreme fear of Emma’s out of control magic makes sense. All of a sudden, I understood why they seemed so eager for Emma to get rid of her magic and be “normal.” Because they’re afraid. Because it’s hard for them to live with the idea that Emma could one day choose darkness. But they need to get over that fear and come to see that everyone has the potential for light and darkness; it’s their choices that determine which comes to the surface. And by keeping secrets from Emma, it feels like they don’t have faith in their daughter’s ability to choose to be her best self and not her darkest. And in an episode that featured truly beautiful moments of people acknowledging the darkness in others but choosing to believe in them anyway, Snow and Charming’s fear of Emma’s potential dark side felt like a major sin. I know that it must be terrifying for parents to have no idea if their child is going to be a serial killer or a Nobel Peace Prize winner, but supportive parents believe their children will choose the right path and allow them to choose that path for themselves. It’s going to be so painful to watch whenever Emma discovers Snow and Charming’s secrets—especially the one directly about her. It’s always a blow to discover your parents have done bad things in their pasts, which is exactly what the discovery of the secret about Maleficent’s baby would show Emma. However, it’s an even bigger blow to find out your parents have been keeping you from becoming fully self-aware because they’re afraid of who you could become. If ever there was something that could push Emma toward darkness, it’s finding out that she was once again robbed of her agency—this time by the two people she’s grown to trust perhaps more than anyone. It would be a sad kind of self-fulfilling prophecy that by attempting to keep Emma from becoming aware of the darkness inside her, Snow and Charming end up unleashing that darkness. And if Emma’s potential for darkness is unleashed, who will help her find the light again? I can see Henry playing a role in that with his Heart of the Truest Believer, and I’m sure Regina will be there to help her see that potential for darkness and even steps into darkness don’t mean you have to turn back to that darkness forever. But my money is mainly on Hook doing everything he can to support her as she works through this knowledge of her worst self by reminding her that people believe in her best self—because that’s exactly what she did for him in this episode. “Unforgiven” showcased Emma and Hook as a true power couple in the Once Upon a Time world. And it did so with the kind of grounded honesty and sincerity that makes scenes between Morrison and Colin O’Donoghue feel like moments from a real-world, relatable fairytale. What could have felt like a rehashing of the “Hook keeps information from Emma” plot we’ve seen twice before instead became something much deeper—an examination of the kind of patience, trust, and mutual support that the best relationships are built on. This time, Hook’s inability to divulge information wasn’t because of a villainous plot or curse; it was character-driven rather than plot-driven. It was a chance for us to see the depths of his self-loathing and the difficulty he still has believing that someone could love him for everything he is—including the dark man he once was. And O’Donoghue played Hook’s sense of guilt and shame perfectly. His inability to believe that he deserved the kind of love Emma was offering was palpable and heartbreaking. Sometimes love requires action, but sometimes it requires words. In this case, Emma needed to spell it out for Hook: She accepts him for who he is and won’t run away just because he has things in his past he’s not proud of. I loved that she came right out and told him that his past with Ursula didn’t matter; what did matter was lying to her about it. That kind of openness is still so new for Emma, but it’s exactly the kind of honesty a relationship needs in order to grow a strong foundation. And in telling Hook that she isn’t going to push him to tell her about his past, she’s giving him space and time to grow comfortable sharing his past with her, which is what he gave her throughout the beginning of their relationship. That sense of balance was written into every moment of their last scene together in the sheriff’s station. Emma’s confidence in this scene was so lovely to see; Morrison did a great job of conveying the fact that Emma feels safe enough with Hook to open up to him completely and to help him feel safe enough to open up to her, too. One of my favorite moments in that scene was when Emma stated that people in her childhood let her down, to which Hook replied (with O’Donoghue’s trademark, swoon-worthy sincerity) that he has no intention of ever letting her down. While Hook’s immediate desire to reassure her of his devotion—even in the midst of his internal crisis—was lovely, the best part was Emma’s simple “I know” after he said it. Those two lines showed how much Emma has grown—from not being able to let herself believe his sincerity to believing he doesn’t want to let her down as if it’s the most basic fact in the world. Emma believes in Hook, and she believes in the strength of what they’re building together. For a long time, Emma chose not to believe in anyone—including in her own ability to be happy. But she’s not that person anymore, and Hook helped her grow into her best self. So she’s going to do the same for him, and I love how characteristically stubborn Morrison played Emma in this scene. She simply wasn’t going to let him lose faith in himself and in their relationship. She saw him at his lowest point (shooting Belle), and she still chose him—because Emma knows more than anyone that who you were isn’t who you always have to be. Emma Swan is finally making her own choices after having her agency taken from her throughout her life, and I was blown away by the beauty of her telling Hook that one of those choices is to see the best in him. That choice represents the kind of belief that true love is made of, and it’s that choice that will help Hook finally begin to believe in himself the way she believes in him—and the way he believes in her. Because this relationship is a two-way street. Just as Emma promised Hook she’d choose to see the best in him, he promised to see the best in her, too. I found his line to be particularly important given what we know about Emma’s potential for darkness. It certainly felt like foreshadowing for a time in the near future when Emma will need someone to remind her of her best self when she’s feeling the pull of darkness. Mutual support is such an important part of all healthy relationships, and that’s exactly what this scene established between Emma and Hook at a time when both characters need it more than ever. Having someone believe in your best self—even when they know the dark things you’re capable of—was an important theme in “Unforgiven.” Henry’s belief in Regina has helped her believe in herself. Emma’s belief in Hook is doing the same for him. And Hook’s belief in Emma will help her through the dark times ahead. Because Snow and Charming’s secrets seem poised to explode at any moment, and Emma is going to need to know that she has people around her who believe in her best self’s ability to be stronger than her darkest self. • Emma’s love for grilled cheese is one of my favorite little details about her. Maybe it’s because I also intensely love that wonderful comfort food. • Is Rumplestiltskin using a cloaking spell to walk around Storybrooke, or are the residents of Storybrooke just not paying attention to who’s roaming their streets? • Belle and Will’s romance seemed to happen rather quickly, but I think I could find myself very easily invested in them. It has some strong potential, and I’m willing to see how it develops before making any further judgments. • No show does a good “dialogue-backed” montage like Once Upon a Time—first with the wedding vows montage in the Season Three finale and now with this episode’s montage set to Snow’s speech to Regina about faith. • Cruella’s nicknames for everyone need to be a running joke this season in the vein of Sawyer’s nicknames on Lost. As always you have hit the nail on the head with this episode. I was pleased with so many of the moments. Cruella continues to entertain me with her wit. One complaint I’ve had about Regina’s sarcasm has been that the writers seem to make it too personal and too mean toward characters. It is hard for me to laugh or cheer on a snappy comment that would hurt someone in the real world. With Cruella, she is a bit more witty and less personal. Many times (with the exception of Rumple) there have been compliments hidden within the snark. I have missed Will so it was nice to see a glimpse. I noticed on rewatch that one of the coffees he bought from Granny (mum) ended up on Belle’s counter. That was cute. I’d like to know a little back story there, but it was good to see Rumple having a human reaction to his wife moving on rather than just being evil and vengeful. I’m glad to see Snow and Charming getting some attention, but hate that it is a secret they are holding back from Emma. That said, I thought it was very cute that they stayed and listened to what Emma said to Killian. That reaction at being caught watching was adorable on all four accounts. Charming was totally letting Snow take the fall for that. Emma never even let go of Killian’s hand and reacted with humor. Snow was flustered and out of sorts for a moment. And Killian looked both annoyed and unable to make eye contact with any of them. I loved the grilled cheese moment, as she had mentioned wanting one all day at the beginning of the show. To have him deliver one to her was cute and sweet, as was his knowledge that she wanted onion rings and not fries. I was even pleased that despite his inability to tell her right then of his past with Ursula, neither of them were screaming or throwing things. Emma expressed her displeasure and he walked away with the comment about the witch hunt. So color me surprised and happy that she must have called him and asked him to come back – summoned in his words. Great scene between the two of them and clearly a step in the right direction. These two continue to be the main characters that keep me tuning in each week at 8 p.m. Otherwise I’d tape and watch later. But there was a raw honesty in those scenes that was just what makes my heart melt. I think the line that got me was when he said that about it being a lot of faith she was putting on him. I noticed that his line was on rather than in, which to me spoke volumes. Faith in someone makes the other person stronger and feel stronger. He still hasn’t had the confidence to tell her about Ursula so Emma’s faith in him is more of a burden than a strength. It is a reminder that she expects him to eventually tell her of this horrible thing. It is a reminder to him that she believes in the goodness in him even if he has doubts. I will say that I was wrong on one thing in my comments. There was one of Cruella’s statements that bothered me. It was the blood diamond comment, but sort of pushed it out of my mind. I think that was supposed to bother us . . . to remind us that she is a villain. I thought it was also a nice nod to the character of Disney’s Cruella. Of course the woman who wants a Dalmatian-puppy coat would be proud of jewelry that came from the suffering and exploitation of others. I absolutely love Cruella’s brand of snark. I find myself wanting to watch her scenes again to make sure I didn’t miss her saying something quick and fun under her breath. And I think you’re right about Killian seeing Emma’s faith in him as something to be nervous about rather than something to embrace in that moment, but I also think it’s important to note that he said that at the very beginning of their little talk. I feel like Emma telling him that she’s choosing to see the best in him and believing he won’t let her down was treated as something that relieved his internal sense of burden—at least a little bit. He knows her faith in him isn’t blind—it’s a choice she’s making to know his past but believe in his future. And I can’t wait for him to fully accept what that means, because I still think it’s hard for him to accept that, after nearly 300 years of believing he was the worst of the worst, someone might choose to love him for everything he is—the good and the bad. Great review as always Katie! I have to say I’m really enjoying the QoD and I’m hoping that by the season finale they’ll have joined forces with Emma and co to defeat Rumple, as I do think that Rumple will stab them in the back as soon as he has all his pieces in place. Rumple seeing Belle kiss Will was great – I loved the shocked look on Rumples face – he definitely didn’t see that coming and after everything he has done I have zero sympathy for him. That said I do think it’s probably a bit soon for Belle to be in another relationship, but I’ll see how this plays out before making any judgments. Really liked the scene between Marco and Regina – she was out of line for shouting at Pinocchio and I loved that Marco didn’t back down until Regina apologized, this scene did an excellent job of showing how much Regina really has changed. And I get the show wants to develop the Regina/Henry relationship this season but can we have at least 1 scene of just Henry and Emma – I miss them! Unsurprisingly I loved all the CaptainSwan moments – it was great to see Emma tell Killian she knows he’s a changed man, and that as long as he doesn’t lie to her their relationship will be fine. Emma has finally gotten to a place where she trusts her parents 100% and so I really wanted Snow and Charming to tell Emma the truth when they went to the police station – yes she’d have been upset but now it’s going to be a whole lot worse. I really like that they told Regina the secret, and now when Emma does find out I want to see Regina acting as a go between Emma and her parents – the idea of Regina being an agony aunt to the Charming family just cracks me up! 4B is shaping up to be great – I can’t wait to watch it all unfold. I’m glad I’m not the only one who really misses scenes between Emma and Henry. Their dynamic has always been one of my favorites, and I could always use more moments between them. I also would absolutely LOVE to see the QoD team up with the rest of the residents of Storybrooke against Rumple by the end of this season. I feel like we all know he’s going to stab them in the back somehow, and I just want those fabulous ladies to team up with everyone else he’s manipulated over the years to make him pay for it. Excellent recap, as always. (As others have pointed out, these are a nice Monday treat.) Hopefully I can comment this week without committing any html atrocities. Emma’s love of grilled cheese (and onion rings) was wonderful. Emma had such a pathetic look outside of Granny’s . . . I, too, found Regina’s apology to Gepetto to be the moment where I had hope for the benefits of Operation Mongoose. I have felt like the search for the Author was, as Cruella put it, easier than blaming bad judgment and gin. However, Regina’s apology showed that she is willing to work hard for her happy ending. Regina is willing to work hard at Operation Mongoose — even if the search itself might be misguided. She’s also willing to accept help with this journey. I’m starting to wonder if the search for the Author isn’t going to end up like Wizard of Oz — she had the means all along. I think Regina’s getting more benefit from the journey than she will the destination. I’m glad I’m not alone in loving the QOD. Ursula’s “I had forgotten how much I missed her” had me rolling on the floor.I pretty much adore every line of Cruella’s. (Sheriff Chiseled Chin was a favorite as well.) Love the interaction and snarkiness. Am I terrible for wanting to see the snarkfest that will be the QOD plus Regina? Oh, and yes, I loved that Emma is now the one to give Hook the time and space he needs. Hook’s patience with Emma has always been a highlight for me (probably because I’m prickly, too, and truly hate it when someone demands or pushes for affection from me. ), so it’s wonderful to see her return that to him. And while O’Donoghue rocks angsty Hook, I miss fun, mischievous, rapscallion Hook. Belle and Will? I can’t wait to see that play out . . . what’s been going on these last six weeks? (I hope I got the time gap right.) Does she have to keep Will and Hook separated? Belle does seem to have a thing for the bad boys . . . gotta watch those librarians . . .
Everything you said about Regina resonated so strongly with me and actually made me a little bit emotional. I agree that it was meant to show that the process of Operation Mongoose—the sense of cooperation, the growing self-awareness, etc.—is going to be the important part, rather than the actual encounter with the Author. I hope (and am starting to truly think) you’re right about the message of this story being that Regina always had the power to create her own happy ending; she just needed to grow in the ways she’s growing now in order to create it. It’s still growth toward an inherently flawed goal, but she’s learning and trying and has already come so far from who she once was. “I think Regina’s getting more benefit from the journey than she will the destination.” – This is such a perfect sentence, and I could not agree more. I also loved what you said about patience in Emma and Hook’s relationship. I think it’s such an underrated quality in romantic relationships, and I’m so happy that it’s one of the foundations of their dynamic. I’m also curious about what you all think about Maleficent’s child: lost as in dead or lost as in missing/taken/gone(but alive)? Great review. I also loved the Emma/Hook scenes. Them vowing to always choose to see the best in one another was beautiful, especially with how they struggle to see the best in themselves. I really loved Emma’s short scene with Pinocchio. It was very maternal and considering how Emma struggled to see herself as a mother in the beginning, it was great to see that instinct not only relate to Henry but other children in town. Regina’s melt down over the book was the first time I’ve been interested in Regina’s character all season. Just how far Regina is willing to go to get her happy ending? Last time she wanted a happy ending she cast the dark curse. I definitely think sending Regina undercover will backfire on Snow and Charming. And if Rumple didn’t fall for Henry suddenly wanting to work for him, I doubt he’d fall for Regina. But can Regina work with these villains and not give into old habits? I didn’t have the same positive feeling about Regina’s apology to Marco. I wanted to like it but at the same time her apology all came back to getting her happy ending. It very much sounded like she was apologizing not because it was the right thing to do, but because she wants a happy ending. Basically it reminded me of what Regina said in 4×08 – that she was only being good to get what she wanted. And if Regina is only apologizing to get what she wants, then that isn’t much of an apology. Emma’s scene with Pinocchio was so cute! I love when she gets to show that maternal side we’ve watched become a part of her character. And as far as Regina’s apology goes, I think it’s one of those scenes that will feel different to people depending on how they see Regina and her arc right now. I found it genuine but can see where others might not if they’re not as fond of the character as I’ve grown to be over the last season or so. I feel like this was one of those episodes that had the necessary plot points to move us forward (Maleficent being resurrected, Snow and Charming knowing about Emma’s potential for darkness, the reveal (sort of) of the Charming secret) but mostly it was a lot of great character moments, and I know both of us would take those over heavy plot driven stories any day of the week. I am also enjoying the breather that I think 4B is giving us in relationship to 4A. After these past two episodes its putting into perspective just how cluttered 4A (even 3B to an extent) really was. And while I loved the frozen characters, I am glad to have my core characters back in the main spotlight. The QoD feel much more integrated with the rest of the cast than any villain in a very long time. I have to admit that even with all the amazing CS development, Regina is the one that had the highlight moment for me. Her coming back to apologize to Marco for the way she acted was everything I want to see from her. As you mentioned last week, its our actions in the present that truly define who we are, and its clear that Regina is FINALLY starting to learn this. She wasnt apologizing for everything bad she has ever done, she apologized for her current actions, because she wants to be better in this moment. And as you perfectly said, “It showed hope and belief that people could have known Regina at her worst but could now choose to see her at her best not because of an Author but because of her actions and choices”. And by Marco giving her August’s things, it was the perfect positive reinforcement for Regina. If I was writing my dream scenario here I would want nothing more than by the end of the season Regina realizing she already achieved her happy ending through this journey. She mentioned to Henry that she wants to go back to when it was just her, Henry, Robin, and Roland, but I dont think that is really her happy ending, because that is an “us against them” mentality. That is Regina being lazy and saying “I dont care how anyone else thinks of me as long has I have these 3 people”. But we know Regina wont be truly happy until others stop seeing her as a villain, and if she keeps up what we saw in this episode, I think that can be in the cards for her. Although, because of this, I have to admit I am a little sad about the whole “go undercover as evil” thing. Regina has been trying so hard for others not to see her as a villain, and now Snow is asking her to be one once again, just like Emma asked of her in 3B. Basically the Charming are the worst PR consultants EVER. Props also go out to Kristin Bauer van Straten, who was able to convey so much emotion in her eyes in that last shot of the episode. I have to say right now, I have never been so immediately on the side of the villains as I am with the QoD. I NEED all of them to be happy. I really wish they could have found some way to make a bunch of money and go live their lives together on an island and just ditch Rumple for good. Better yet, turn Rumple into their butler/housekeeper. I feel like that would be the most fitting sentence for him. I am going to have to hold judgement on the whole Charming secret thing, but if I have to hear Snow call the QoD villains every episode for the whole season its going to try my patience. It made sense when she kinda panicked at the town line in the premiere, but she’s going to have to come up with a better excuse than “they’re villains!” eventually. Its pretty much the ONCE equivalent of “Because I said so”. And then of course there was Hook and Emma, who are just perfect at the moment. He brought her lunch! (totally the way to my heart), and by the end of the episode, despite a small conflict, were closer than ever. I loved their declarations that they are going to choose to see the best in each other. To me it had the feeling of wedding vows with them sitting there making grand promises with their hands clasped, with even the Charmings as (eavesdropping) witnesses. I also loved that moment of interruption, and everyone’s reaction to it. I will admit I am starting to get a little nervous about the possibility they are going to somehow tie Emma’s darkness into the two of them taking their relationship to the next level, but we will have to wait and see. I am enjoying the good while we have it, and I have no doubt these two are it for each other in the end. And one final point, if nobody brings up Hook’s transition from “Villain” to “Hero” through his actions to Regina this season I think I will be very disappointed. Hell, even the the promos show Emma, Hook, Snow, and David together every time they mention the word Hero! I also got the wedding vow vibe from that scene with Hook and Emma. And it didn’t help that their final scene was them walking down the street arm and arm like a couple walking down the aisle. Awww those vows are so sweet! And they’re so much like that moment between Emma and Hook that I’m now getting emotional all over again. I completely agree with you about the focus on the characters being this episode’s biggest selling point for me, which shouldn’t surprise you at all. Yes, this episode set up some important plot points, but it was more about not just character interaction but character motivation. It allowed us to really get inside the heads of some of these characters, and I loved getting that little breather in order to explore why these characters are acting the way they are instead of just having us guess their motivations and having them talk at each other and not to each other with real depth like they did in this episode. Your idea of Rumple being the butler to the QoD is now my favorite mental image ever. I can picture Cruella ordering him to make her drinks, and it’s the most fabulous thing imaginable. Finally, I am 100% with you on Regina and Hook needing to talk or Emma needing to talk to Regina about Hook and his transition from villain to hero just by choosing to do the right thing. I think Hook is still struggling with seeing himself as a hero at this point, so maybe it would need to be Emma telling Regina (which Hook overhears, of course—and now I’m writing fan fiction in my replies). Ugh. I just wanna give Regina a hug. I love how he writers are developing her character, I love that it’s not a super smooth transition from villain to hero simply because that’s not realistic. Turning from good to evil (especially for her) isn’t as simple as flipping a switch, it’s more like knocking down a rotten house and rebuilding it from the foundation up. Regina journey isn’t about just becoming good, it’s about self love, self image and becoming mentally healthy and being able to experience healthy emotions and have healthy interactions with other humans which is something she has struggled with previously (partially thanks to Cora’s parenting) and that is definitely gonna take time. This is also why I’m never that bothered by her momentary lapses, they’re necessary for her to grow and learn. Her relationship with Henry has come so far, I love that he accepts who she was, sees and supports who she is and is willing to stand by her and help her get to where she wants/needs to be instead of rejecting her. I thought the moment where Henry stood supportively beside Regina as Cruella and Ursula tried to make her uncomfortable by bringing up her past in front of Henry was really nice. There was no judgment from him or discomfort and he gave her a reassuring smile, reminded her which donuts he wanted and basically completely ignored them. Then later reaffirmed that she is not that person anymore and let her know that he truly gets that and she needs to as well. I also love how open and honest she is with him regarding how she was feelings and Robin etc. Another great moment (and one of my all time fav moments for Regina) was the apology to Marco. I like that she opened up and allowed herself to be vulnerable before him as she tried to explain to him where the outburst came from, but also gave a very sincere apology saying she was out of line and was able to place herself in his shoes by saying if someone had spoke to her son that way, she would’ve done much worse, which was her emphasizing how wrong she knew she was. This is something she wasn’t capable of a couple seasons ago. Then when he turned around and gave her August’s bag it was just such a heartwarming moment. I honestly felt like a proud parent watching that scene. As much as I love the Snow/Regina relationship and the way Snow is at a point in her relationship with Regina that she would tell her her deepest darkest secret, I kinda hate that Snow is asking (demanding) her to go undercover and pose as a villain. It’s like forcing a recovering alcoholic into a bar when they are still struggling. While it will probably end up being great for her personal growth, because I doubt she’ll truly go back, I’m still not a fan of this plan. She struggles enough with controlling her darker instincts and no doubt the QoD are gonna try and make her prove that she really is dark by making her do something. This plan would also annoy me less if it didn’t feel like the Charmings were kind of using her to cover their own sins. They don’t mind her going undercover, they don’t mind that she is still battling with her darkness, they don’t consider how the rest of the town who have finally started to forgive her may see her based on this, but they’re super concerned that their secret remain hidden and their image of purity remains intact. This also goes back to the flashbacks with Maleficent. Maleficent went to Snow so they could collectively stop Regina’s curse and even after explaining to Snow that they were both pregnant and needed to stop the curse so that both of their innocent, unborn children could be safe, Snow again decided that saving her own and keeping herself “pure” was worth more than the life/safety of Maleficent’s kid. I love Snow and Charming but I was annoyed they spent this whole episode blatantly lying to Emma’s face and running around SB trying to make sure their secret stays a secret instead of just owning it and being honest. They have to know that is clearly not gonna stay hidden and if/when Emma finds out this secret from someone other than her parents, she’s gonna feel way more betrayed than if they had just been straight with her. It really sucked to watch Emma know there was something going on with them, question them, be lied to and eventually just choose to believe them because she felt that because they are closest to her they’d be honest. I feel like for Emma, who is so guarded to allow herself to go against her better instincts and trust something/someone that she knew was a lie, is gonna make her close herself back up somewhat. Same with Hook in a way. she’s already told him the past is the past, she knows he’s done villainous things during his time as a villain, but also knows he’s changed and is basically giving him a pass which he is too afraid to take, simply because he doesn’t believe that she truly will be able to see beyond what he’s done. Hopefully he tells her his secret before the Charming’s secret comes out, because after their secret drops, I think she’s gonna be less inclined to see the best in those closest to her as they’re all lying, and that might get in the way of him being able to get through to her when she does start to turn dark. Belle and Will came out of nowhere! …but I like it. I love Rumple and Belle together but I’m glad that he’s genuinely gonna have to fight to win her back. This is gonna be a test for him too, will he put love over power (and villainy) and genuinely try to win her back, or will he just try and kill Will and make his situation worse. (I would’ve said rip Will’s heart out but I can’t remember if Will even still has his heart, need to re watch OUATIW). – I appreciated the montage at the end on the second watch, during the first watch I was mentally screaming at Snow to hurry up and tell us what she did because the episode was about to end lol. – I also found it ironic that for parts of the episode in the bottom corner of the screen it had “Up next: Secrets and lies”. That was beyond appropriate for this episode. While I loved the words, I was so impatient during the montage too. When they finally cut back to Snow and Regina I was yelling at my TV for her to just spit it out already! Wedding vows can be as long as you want, but if you are trying to tell someone something important, its not the time for a grand speech. And I am totally with you for being annoyed with Snow for asking Regina to go undercover. Not because I believe that she is going to relapse, but because she is trying to work on her image within the town, and she is being asked to sabotage that image. Unless everyone in the town truly believes the QoD have honorable intentions, in which case Regina hanging out with them might not be as detrimental as I am thinking its going to be. I loved everything about this comment, Kaydee. I always look forward to your thoughts on Regina. Like you, I think her apology to Geppetto was one of my favorite moments of hers on the show so far. As you said, her journey is about self-love, and that apology was filled with the kind of honest understanding of your worst and slow uncovering of your best that’s needed in order to finally reach a place of self-love and start developing healthy relationships with those around you. Count me as another person frustrated with Snow telling Regina she needs to go undercover when she knows how hard Regina is working to be better than who she was. Your analogy to asking a recovering alcoholic to walk into a bar is perfect. This episode showed that Snow is still so hung up on the idea of “heroes” and “villains” that it’s making her act more like the latter and less like the former, which she’s trying so hard to project the image of. It’s a compelling story to tell and one that’s very applicable to the world at large: People often act their worst when they’re trying to protect a public image of wholesome goodness. And I’m really interested to see how Snow and Charming grow from this, in addition, of course, to seeing how Regina and Emma grow. I’m very intrigued about the Snowing v Maleficent arc but at the same time it feels like the writers (again) are putting down Snowing to upper up Regina, it feels like there’s no coincidence that their secret is related to Mel’s losing her child when this is what Regina did to them, so I really hope we won’t get parallels about it. I love the QOD, actually I love Cruella and Mel, less Ursula (something about Merrin’s acting bothers me and I can’t put my finger on what that is). Cruella is a fresh light, her sass is awesome. and Mel is such an interesting Villain, human villain (much like Ingrid – Oh I miss her alot). She broke my heart at the end with the cradle. I’m not a big fan of Regina’s redemption arc or the Author arc because I think she is going at it the wrong way, You need to want to change within and not relay on outside source to change your story, still with the hints we receive every episode I wish this will be the lesson from the author arc, I did like her interactions with Marco, I was cheering him up when he lashed at her but her apology felt really genuine to me, made me think maybe finally she is starting to go at it the right way. The highlight of this ep for me was CS! when the sneak came out (their first conversation at the sheriff station) I was hoping the resolution of it will be Emma helping him with his insecurities and I loved that it was exactly that. After 4a I lost some faith in the writers to do CS justice because there was no resolution to the Heart arc, so I was very pleased that finally they are touching what made Hook doubt himself in the first place in 4×04. I loved every part of that conversation, from Emma pointing out that the lie itself bothered her to insuring him his past doesn’t define who he is in her eyes now and that won’t change. just like in s2+3 Emma always waited for the other shoe to drop, he is the same – deep down he fears that eventually Emma will open her eyes about him and leave so he most definitely needed to hear her put all her faith in him, he deserved it, he has been by her side helping her in every step of the way and I wanted to see the tables turn and her helping him because despite his tough exterior, he is broken inside. Their exchange of faith in each other felt alot like saying I Love You without saying it, and it will be impotent with Emma’s arc because I believe Hook will be vital in helping her fight the darkness. Thanks for the nice words and for sharing your thoughts with us! I think your hopes for the Author storyline and Regina’s arc are what we’re seeing the seeds of already in this episode. I think Regina needed something to kick-start her decision to be better than she once was, and I don’t see that as necessarily a bad thing, as long as she grows to discover that she wants to be good because it’s the right thing to do and not just because it will give her what she wants. And I think that’s what her apology was all about. She didn’t know he would have something to offer her; she apologized because she knew that was the right thing to do and she knew that she would wanted someone to apologize to her had they spoken to Henry that way. Getting August’s backpack was an unexpected bonus, and I think that was meant to show that these characters can earn their happy ending through small choices to be their best selves rather than convincing the Author to had it to them. I also share your happiness that the show is directly addressing Hook’s self-doubt and its place in his relationship with Emma. I can understand why people were disappointed at the end of 4A, but I think it’s important to remember that it was a midseason finale—not a season finale. Everything didn’t need to be addressed right then as long as it was addressed at some point, which the show seems to be doing now with great emotional impact. I’m actually happy they didn’t try to cram this kind of moment in the midseason finale because it needed the time and focus that it’s getting now. Okay so I just rewatched this episode so I feel as though I can actually have an opinion on it, haha. I’m definitely sold on the Queens of Darkness. They’re relatable already in a way that appeals to me and we haven’t even had any of their back stories yet which means that once we do, I’ll be head over pearls in love with them all even more. They mesh into the show in a way that is incredibly refreshing after the Frozen arc (which I felt at times was a bit forced and far too much about them compared to the main characters of the show). These characters have a background that already feels much more real – even though we still have no idea how they ended up in New York. The last scene with Malificient sent chills up my spine and was absolutely heart wrenching to watch, especially as a mother myself. 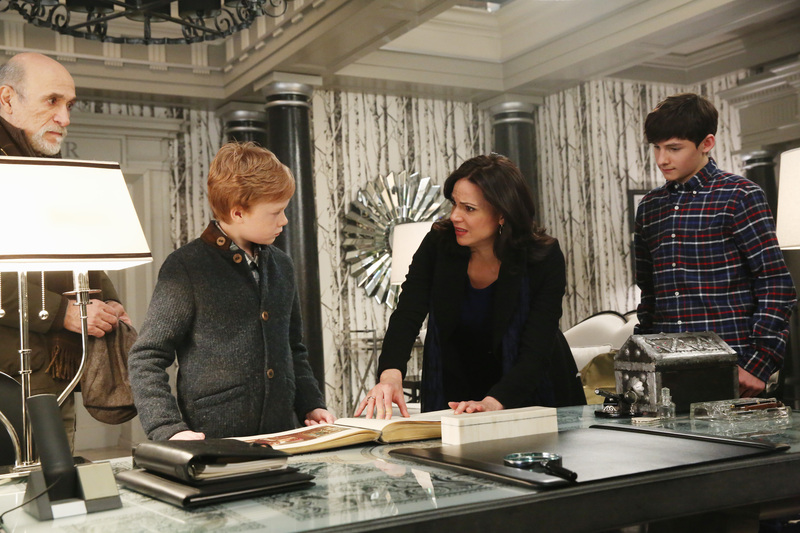 Can I just say I loved Henry this episode?! He's grown into this young man and I do hope that they begin to use his character a bit more in depth. I'm so interested in him lately – I wonder how he feels about trying so so hard to find Regina's happy ending. It's obvious he wants to help, but sometimes I wonder if a 13/14 year old boy wouldn't feel a bit hurt or some sort of emotion over realizing that HE isn't enough for Regina's happy ending. /shrug. Maybe it's just because I want more Henry. Emma and Hook – can I just say that the little disagreement they had was done brilliantly? Our little Emma is growing so much, hehe! I love angsty Hook – but if I don't get some clever and witty remarks out of the dashing rapscallion soon, I'm going to cry. The angst has been played for 14 episodes now, so I'm ready for a bit of lightheartedness when it comes to his character – much how he was in Season 2 and 3 …but you know, with out the villain behavior, ha! I thought the same thing about their little vows to each other and it didn't help when they were waltzing down the street like it was an aisle that there is a huge poofy wedding dress in the background in a lot of their scenes when they're walking through the town, haha. A fangirl can dream, you know. (Though since I'm a Lost fan, I am a firm believer in that there are no coincidences on this show and I tend to overanalyze everything , haha). I'm excited to see how Hook is going to help Emma through her darkness! I’m also impressed with the fact that I like the Queens of Darkness so much without having any backstory for them yet. And, like you, I know that once we get those backstories I’ll love them even more. As far as Snow and Charming go, I think they were supposed to be seen as acting out-of-character. They’re in unfamiliar territory here, doing things they don’t want to do and aren’t used to doing, like lying to Emma. But what I did find to be in-charcter for them was their clear line of demarkation between heroes and villains, which I can’t wait to see become a little less clear in the coming weeks. Everybody has light and dark in them—and those two characters need to face that in order to grow into the best possible versions of themselves. I’m apparently just slow to warm up to this arc, but I’m now all in on the QoD. I loved Cruella commenting on how attractive Charming was even if she doesn’t like him and really love the tiny detail of her casually stroking her coat in the background of scenes. It’s so subtle but really effective for the character and great work. I was also a big fan of Cruella and Ursula’s reaction to Maleficent’s return, I just want to watch these ladies hang out together and snark and look fabulous while doing so. I’m not a huge fan of the Snowing secret plot but at least a little of that is that I don’t want them to keep things from Emma. At some point, I feel like you have to own up to what you’ve done, no matter how bad and I’m frustrated that Snow isn’t willing to do that. It’s good that she recognizes that Maleficent has a legitimate reason to be mad at them but I don’t feel like she’s taking responsibility for it yet. I’ll also probably be a little annoyed because I just don’t understand Snow’s thought process. I’m far too pragmatic to turn down help even if it comes from a source that wouldn’t be my first choice of ally. If the QoD were willing to stop the curse, I wouldn’t have had a problem teaming up with them. I am so excited for Regina and her story this half-season though. She’s growing and doing so realistically and I’m just so proud of her. She’s frustrated and wants to get that feeling of happiness she had back and that’s so understandable to me. She got to be happy for a short period of time and then it all just went away again (by her own choosing, which is still huge to me) so she lashed out. She’s human, she’s not going to suddenly be the best person ever overnight. But then she went and apologized to Marco and recognized that she wasn’t being her best self and that Marco’s reaction to her behavior was justified. It was an amazing moment of growth for her and I can’t wait for her to continue to work toward being a better person. Unpopular opinion time, I still kind of want the Author to be not 100% and play at least some role in manipulating their fates. Not because I want to take away their agency in creating their own happy ending, but because I want the story to also be partly about overcoming other’s perceptions of you and writing their own story by defeating the Author. Finally, I’m also so so proud of Emma. She’s so explicit about actively choosing her happiness and fighting against her instincts to withhold trust and I couldn’t be more thrilled about the message it sends. I hate that the basis for that trust is going to be shaken when she finds out that her parents were lying to her but I think she’s found she’s happier defaulting to trust when it comes to Hook so at least she’ll have someone to talk to about it. It’s so hard to open up and choose give your heart to someone with the certainty that they’ll take care of it but that’s exactly what she’s done and it’s what’s going to help her continue to grow and Hook begin to heal and grow as well. I still think the author/book plot has potential to be great and I am kinda hoping we are going to get some “what ifs” or “parallel universe” scenarios out of it. I am a sucker for the “be careful what you wish for” trope, which Buffy always did so well. I think it’s interesting that in a way Regina tried to write her own happy ending with the dark curse in the first place, and we all saw how that turned out. Now that I am thinking about it, I am curious if the creator of the dark curse and the author and/or sorcerer might actually be tied together. The flashbacks keep pointing back to the dark curse, so I am starting to think they are most likely related! YES! Buffy did parallel universes so well and I’d love to see something along those lines on OUaT. Also, I like the idea of the creator of the dark curse/author/sorcerer being the same person or related in someway. It would be fitting with the show with all the numerous interconnections these characters seem to have with each other and I think that could be a really great story line. Hmmmm . . . that is an interesting take on the Author . . . I do like the idea of defeating perceptions (and manipulation). I feel like much of Snow and Charming’s issue is that they are more concerned with being perceived as good rather than being good. 1.) Once again our Ravenclaw and Slytherin sides are so similar because I’m with you on being willing to team up with the Queens of Darkness to stop the Dark Curse. If it gets the job done, then why risk cursing an entire kingdom because you don’t want to be seen cavorting with “villains”? I actually wondered if the tree rejected Snow and Charming not because of who Emma could be but because Snow and Charming didn’t act like “noble heroes” by sneaking away from the people they promised to work with. 2.) I’m super intrigued by your Author theory. I was 100% against the Author having any say in these characters’ stories, but I kind of love the idea of fighting against someone’s preconceived notions of who you should be and reclaiming your story after someone has been writing it for you. It fits with Emma’s speech about “punching back and saying, No this is who I am” from Season One, and it really fits with the whole point of the show, which is to take these characters who were all written a certain way and ask: But what if the author only got part of the story right? Good news – Cruella is growing on me! I loved her snark this week. And Snow being a giant dork, trying to escape from listening in on Emma and Killian was hilariously awful. I don’t enjoy Snow and Charming keeping secrets and lying but I appreciated your linking that story back to them wanting Emma to be “normal.” That hadn’t bothered me as much as it did many people (because I get that impulse of just wanting to see your kid be happy if being special makes their lives difficult) but it makes even more sense now. I’m ready to see this whole story play out. I didn’t not enjoy the episode, but I think I’m feeling a little impatient for things to really start. I’m so glad you’re liking Cruella more now! Her sass was perfect in this episode. I love your reviews as always. The book is a record of her past—she’s the author of her future. My sincere hope for finding the author of the book storyline is that we find out, that the book only records everyone’s choice and the author himself has no power over what our characters do. It’s their choices who define what they become. That’s only satisfying conclusion for me and quite honestly, we’ve seen all along since the beginning of this show, it’s been character’s choices which define what they become. Cora chose power over love. Regina chose revenge over hope. All of these choices have consequences. On the secrets being kept this season (first, specifically from Snowing). I think it’s going to become a fulfilling prophecy of sorts, you know? By Snow continuing to hide this secret from Emma , it’s going to further drive her towards the dark side; so when the truth inevitably comes out in a bad way, Emma won’t need much of a push towards the dark side. I also love how different both Hook and Snowing’s secrets are from each other. Hook’s secret had nothing to do with Emma. It all has to do with his pirating days and what he did at his lowest and his worst, which again, has nothing to do with Emma. I loved how Emma responded that she knows Hook isn’t that person anymore and what he did has no bearing on their current relationship and that she’s going to continue to see the best in him. I think you’re right, Hook will ultimately be the one to save Emma from her darkest self and in doing so, will truly make him a hero. Snow and Charming’s secret however, like Neal’s secret, I can see this wounding Emma in the worst possible way. This one will have bigger implications because it directly involves her. And once again, people Emma trust are hiding something from her and in a way, taking away her agency to decide. Love this episode, the arc and continue to love Monday mornings with your recaps! My heart broke all over the place with everyone lying to Emma, but I loved how she pulled it all together. Hook will tell her the truth; I don’t think he was intentionally lying to her as much as he was shielding himself from the immense guilt and shame he was feeling when Ursula resurfaced. I’m kind of dying to hear that secret. Snow…Charming…you can’t even play the dark side properly! I laughed out loud at each of Cruella’s snarky comments.